I’m very exited to have one of my big-cat quilts included in a show at Limner Gallery in Hudson, NY. Swing by if you’re in the area. The show, called Arte Natura, is up May 9-June 1. The saber-tooth will be for sale. 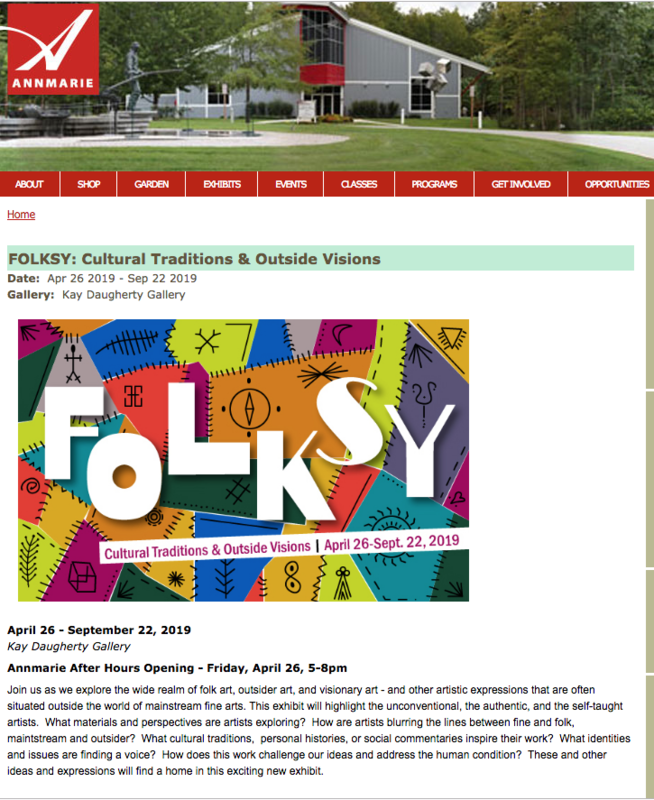 The reception is May 11, from 5-7 pm. I was wondering where my next adventure would take me when I came across the excellent book The Mola: Traditional Kuna Textile Art by Edith Crouch (Shiffer Publishing, 2011). Captivated by these colorful textiles, I started planning my next trip. Hand-appliquéd molas form the bottom part of the blouse of the Kuna (or Guna) women. The blouses are complemented by a headscarf, golden jewelry, a wrapped, patterned skirt featuring palm trees, birds or pineapples. The women, who formerly painted their legs, now wear a type of bottomless “sock” made from tiny beads. I have rarely I admired a people’s sense of fashion more than that of the Kuna women. In early March, my husband and I flew to Panama City. 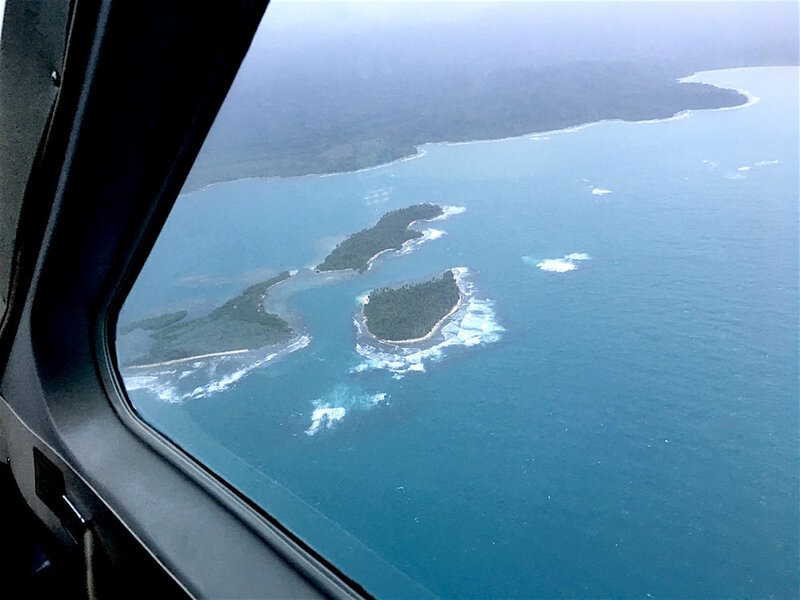 From there we took off to Playon Chico (“Big Little Beach”), one of the 364 islands in the comarca Kuna Yala, a semi-autonomous, indigenous territory located off the Caribbean coast of Panama, formerly known as San Blas. We wanted to visit some of the women who have been making molas for the better part of their lives. After an adventurous flight in a tiny propeller plane, we landed at the minuscule one-strip airport of Playon Chico. It was good to see from the air the wide swaths of virgin rain forest, yet at the airport things looked very different. A plane had crashed only two weeks before our arrival, adding to the mounds of garbage surrounding the airport and beach. 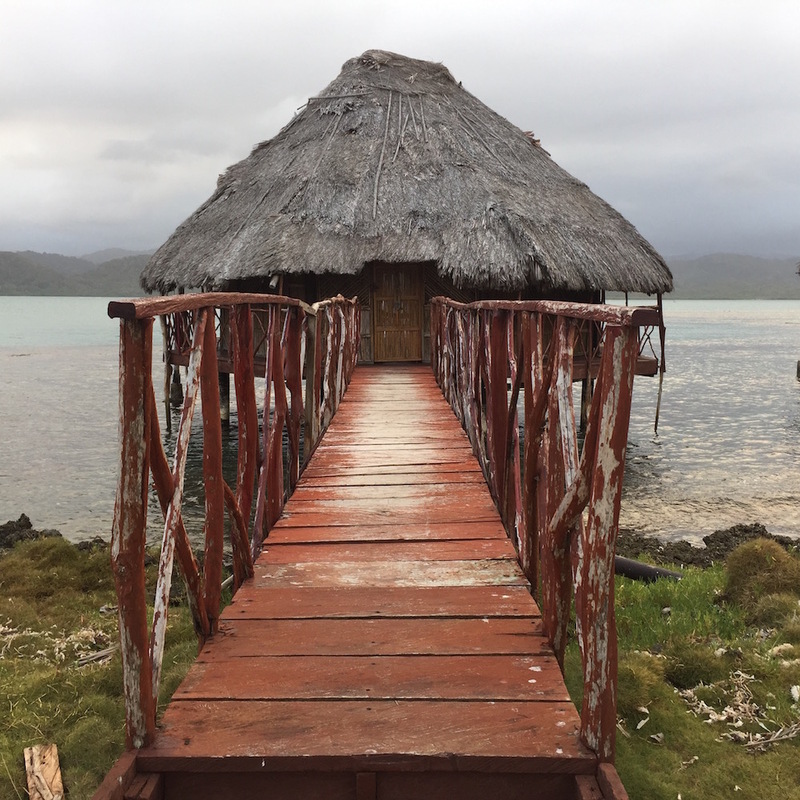 Our guide took us to the Yandup Lodge, a scattering of charming seaside cabins on another tiny island, a ten-minute boat-ride from Playon Chico. Yandup Island was pristine, and it was easy to forget the garbage dump surrounding Playon Chico. One afternoon we went into town, where our Kuna guide introduced us to some of the mola artists. (The artists, I read, are comprised of cisgender women, but also count some transgender women, omekit, who enjoy great freedom and acceptance among the Kuna). 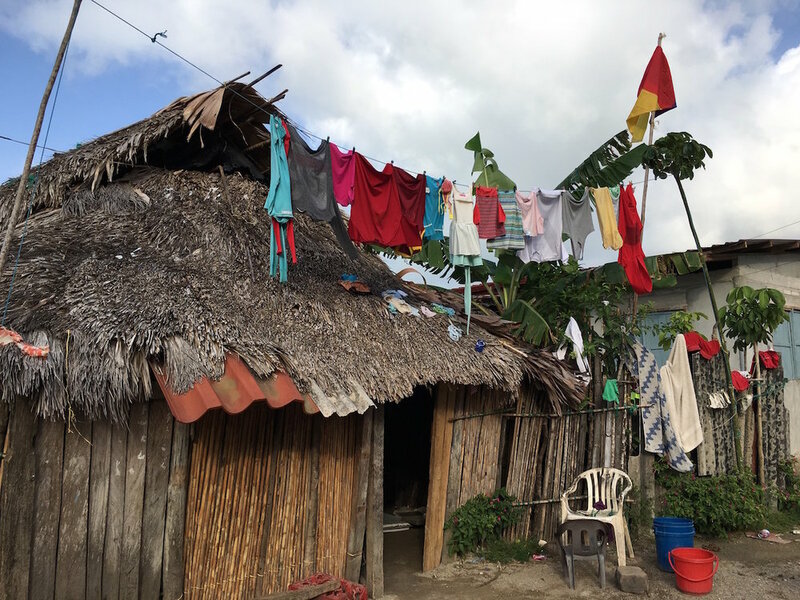 Playon Chico counts roughly 3,000 inhabitants who live in “pole”-style thatch huts with leaf-covered roofs and simple outhouses at the end of small docks. Fresh laundry was fluttering in the wind. This afternoon, a big boat had docked in front of the “town square,” which we were told “sometimes has internet.” The boat’s Colombian traders were in the process of picking up coconuts for the coconut oil production in their native country, whose border lies 80 miles southeast. Despite its small size, Playon Chico has a comparatively wide main street where women display their art and children play and roughhouse amidst raucous laughter, followed by a slew of dogs and cats. Sadly, many of the women’s molas were bleached out by the sun, and business seemed limited to two artisans whose molas were in spotless condition. Molas are often judged by whether they are the more modern, conventional appliqué or the traditional, more time-consuming reverse appliqué, in which fabrics are first sewn together in layers, then cut away from the top in patterns revealing the fabric underneath. At first sight the difference is hardly noticeable and to me the judgment seems misplaced. Yes, reverse-applique is more labor-intensive, but who judges art by the time it takes to make? Besides, at $25 a mola, who could blame them for taking the faster route? After all, cost of living in Panama is almost as high as in the U.S. What counts is the concept, the composition and the sensitivity of the design. Taught by tourists who have read that reverse appliqué is more valuable, regardless of concept and design, the Kuna women in Playon Chico were quick to point out the multiple layers that went into their molas. The molas’ subjects are varied and range from flora and fauna commonly found on the islands—think crabs, starfish, exotic flowers and birds—to abstract geometric patterns, Kuna mythology and, occasionally, a grinning Jesus on the cross. (Naturally, I bought one of the latter.) One mola I saw featured pipes and, at first, I thought that this motif was geared at pipe-smoking tourists, until I saw that Kuna women commonly smoke pipes. Edith Crouch’s book also features molas tackling more “modern” imagery, such as helicopters and planes. Looking at the molas one can’t help but wonder whether Keith Haring’s work was inspired by the art of the Kuna women. 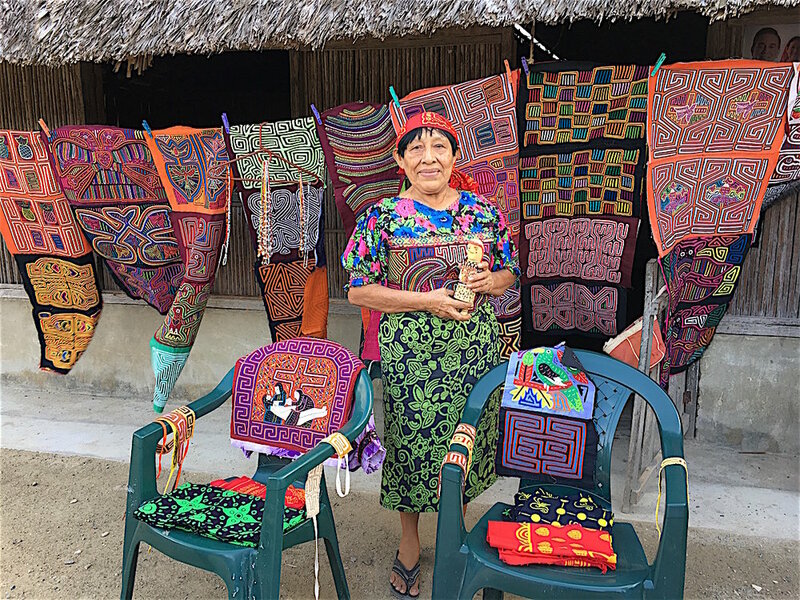 The sale of molas to tourists constitutes an important income source for women, who, Steven G. Snow writes, now often out-earn their husbands, who fish for lobster and sell coconuts to Colombians. This, some argue, has exacerbated the divisions among men and women. Snow laments that Kuna women have adapted to the tourism market, abandoning traditional motifs and selling instead “Hard Rock Café: San Blas” molas. This made me wonder why we want to limit indigenous people to their traditional motifs while we, tourists, are free to explore and follow our inspiration and business instincts. I didn’t find the often-lamented loss of artistic traditions a problem; as far as I could see, high-quality, artistically relevant molas were going strong, regardless of the subject matter. I am a big fan of all things cat, and saber-toothed tigers have held a particular place in my heart and imagination. Characterized by long, curved saber-shaped canine teeth that possibly extended from the mouth even when it was closed (magic, I know), the saber-toothed “tiger” (“Smilodon”) wasn’t a tiger at all. She didn’t live or hunt like the modern tiger and she didn’t even have stripes. In fact, since fur decomposes much faster than bones we don’t know what kind of coat the saber-tooth wore. What we do know is that she was stocky. With a skeleton that compares more to that of a bear than a tiger, she was about a foot shorter than today’s lions but nearly twice as heavy. Found in North America and Europe, this type of cat ruled the world from about 16 million until 11,000 years ago. They used their saber-teeth to stab bison, horses, sloths and mammoths. Unlike today’s tigers, saber-toothed tigers were social creatures. Bone fossils suggest that crippled saber-tooths limped around for years, which might mean that they were “cared for” by their peers. So if saber-toothed tigers were so caring and powerful, why did they go extinct? Researcher Larisa DeSantis, a vertebrate paleontologist at Vanderbilt University in Nashville, told LiveScience, "The popular theory for the megafaunal extinction is that either the changing climate at the end of the last ice age or human activity, or some combination of the two, killed off most of the large mammals. 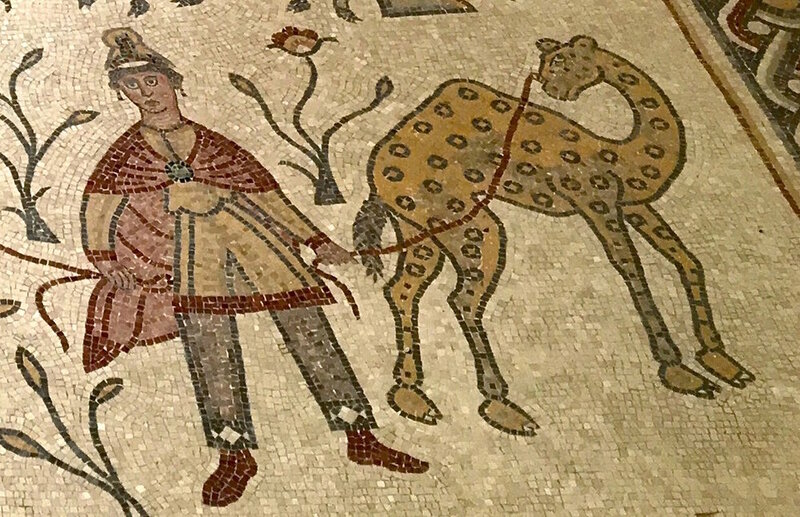 In the case of the great cats, we expect that it would have been increasingly difficult for them to find prey, especially if they had to compete with humans. We know that when food becomes scarce, carnivores like the great cats tend to consume more of the carcasses they kill. If they spent more time chomping on bones, it should cause detectable changes in the wear patterns on their teeth." The saber-toothed tiger’s long, stocky appearance make her a perfect subject for a king-size headboard. I was also excited that I could create my own fur pattern. Not that anyone dictates the patterns I choose for my animals, but I found that the more I know about an animal’s real appearance the less bold I get. And never mind that the saber-toothed tiger didn’t have a long tail but a stubby, lynx-link protrusion. Thankfully, I didn’t find out about her silly stub until I had created this beautiful large-tailed beast. Made from Kona cotton, 100% cotton batting and Finca Presencia cotton thread, this kitty is for sale. Contact me for details. Pacific Standard Magazine (whom I’ve written for in the past) just published an interesting article by Sarah C. Rich about the Social Justice Sewing Academy, which organizes quilting circles for activist youth in American schools. The organization was inspired by the 23-year-old founder Sara Trail, who first used quilting in high school to express her intense feelings about Trayvon Martin’s death. While quilting has the reputation of just being a hobby for grandmothers, it has always been a mode of communication and, at times, a political tool. 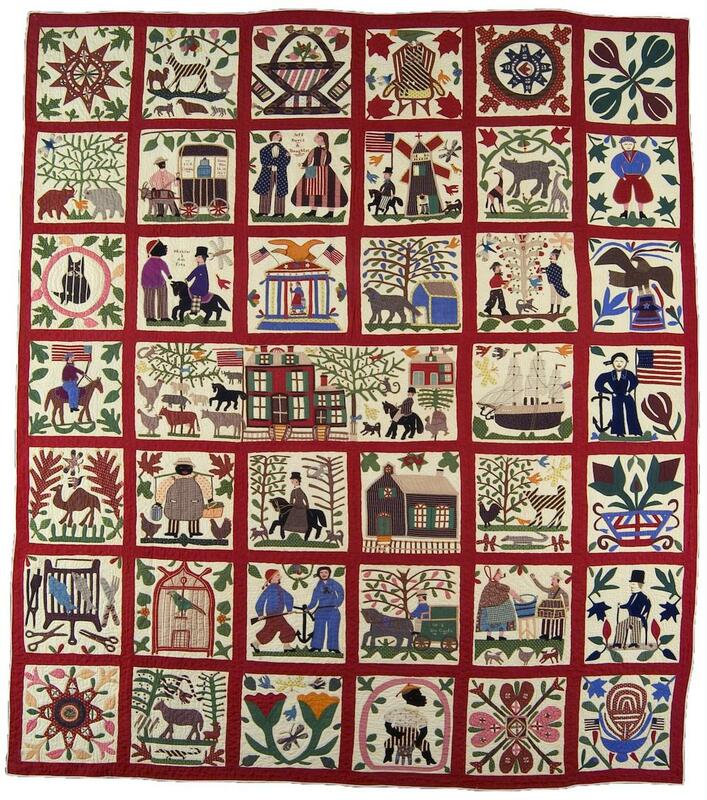 Lucinda Ward Honstain’s “Reconciliation Quilt,” from 1867, for example, depicts key moments of the Civil War. An anonymous 19th-century quilter made her feelings known about women’s suffrage. In 1987, the AIDS Memorial Quilt made visible the lives of those lost in the epidemic on the National Mall in Washington, DC. Recently, quilting as a tool of resistance has experienced a revival at QuiltCon 2018, the Modern Quilt Guild’s annual convention. While sometimes heavy-handed and failing to take the medium into consideration, the works serve as a good example of how quilts can be utilized to express political anger and fear. Lucinda Ward Honstain (1820-1904): “Reconciliation Quilt,” 1867. What’s most interesting about Sarah Rich’s Pacific Standard article is her equation of quilting and social media. Maybe this is what it takes to get young people involved, as quilting might seem too quiet and slow to hold teenagers’ attention. But it goes far beyond that. Today it is rare that women sit together quilting one giant piece while discussing the world’s woes. We are no longer confined to our living rooms, and social media has made it easy to spread and exchange images and ideas, creating an illusion of togetherness. There is something to be said about the power of community of times past as it unfolded around the quilting frame. One could benefit from the meditative experience of quilting, while creating a “social medium” that has the power to spread love and fight injustice. Collaborative quilts for donation to children’s hospitals and Abolitionist Quilts that raised funds for the cause are good examples. Modern social media, on the other hand, often leaves the quilter isolated, fighting his or her demons in the quiet of one’s home. The Social Justice Sewing Academy seeks to change that--ironically, through the help of real social media. “Through Instagram, Trail has built a worldwide network of seasoned quilters, to whom she mails the students’ fabric squares for final stitching,” Rich writes. “Most volunteers are older, white, and living in places where they rarely come into direct contact with youth from marginalized communities.” As such, messages of resistance are distributed not just via a tiny photo on Instagram to be “liked” by people who will forget it in seconds, but are carried out together. Quilts make protest real and tangible, building and reaching communities who would otherwise be spared from contemplating the injustice that plagues modern day America. The Camel Quilt Is Done!!! At long last, the camel quilt is done. And I’m very pleased with it. What fun to be able to incorporate tassels and pompoms and beads! What do you think? As I wrote in a previous blog post, this quilt was inspired by my recent vacation in Jordan. The little “plaque” on the quilt reads “From the middle I pick you.” I saw it on the side of a 4x4 pickup. It was accompanied by a little graphic of five little figures and a hand picking up the one in the middle. I loved the sticker so much that I decided to incorporate its message in this quilt. I was searching the Internet for inspiration to embroider an old, black wool poncho that I had tired of, and I came across the little-known fad of Mexican tourist jackets from the 1940s and ’50s. Adorned with colorful folkloric scenes, these embroidered wool jackets were made in Mexico for American tourists. Unlike Mexican floral shirts, which were primarily intended for Mexicans but eventually caught on in the U.S., I think it’s safe to assume that Mexicans never wore these garments. 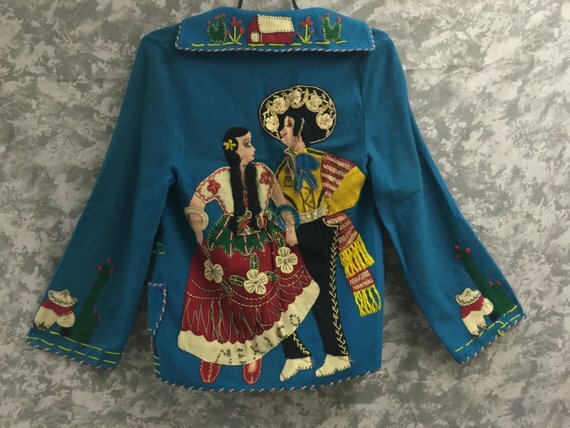 Funnily, my Mexican husband had never heard of the Mexican tourist jacket, despite his keen interest in Mexican folk art. 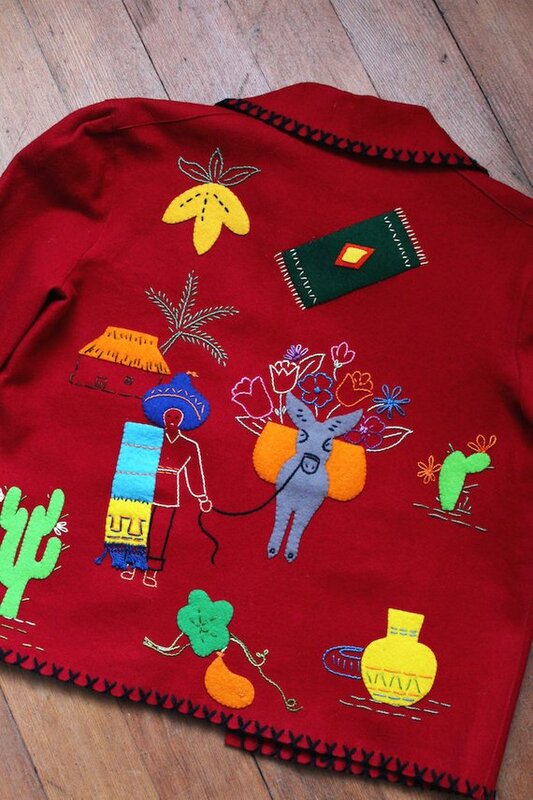 As you can see, the jackets are made with care, featuring lively donkeys, cacti, flowers and village scenes. A popular trope is the couple engaged in play and dance. I particularly like that the embroidery in these jackets is kind of rough, with the artist using big stitches with thick wool thread, as opposed to thinner cotton or silk thread, which would have allowed for more detail. This gives the jackets the kind of folksy flair that I strive for in my quilts. That the jackets often feature animals helps, of course. On the other hand, the imagery raises a host of questions. What was it that attracted Americans to these garments? What kind of fantasies did they conjure up? And would it be insensitive to wear them today? Life in America during that time was conservative and constrained, particularly for women, the target consumer of these souvenirs. This attire might have allowed the female wearer to express a desire that had been thwarted. As such, the jackets are a testament to an environment that was not only warmer, both physically and emotionally, but also more colorful and passionate. Maybe the jacket allowed American women to feel free and liberated, if just for a moment. Or maybe it was a convenient way to show off one’s worldliness? Like, “Look, I have been to exotic places and I am carrying a bit of their effervescence with me.” American couture of the time might have looked bland and inhibited in comparison. 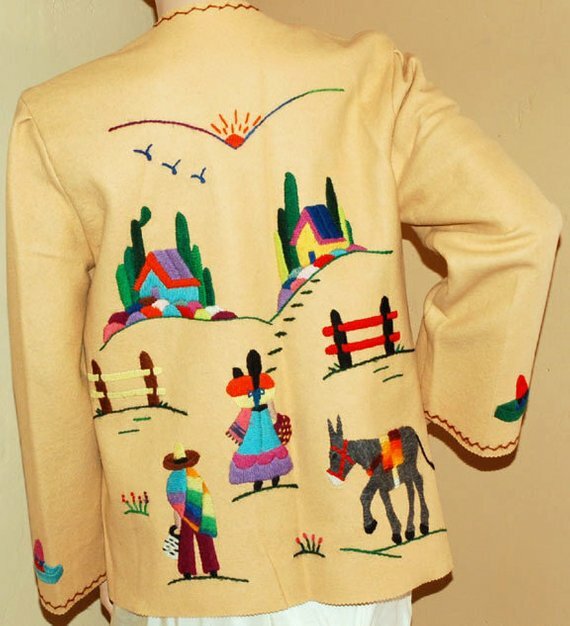 A quick search for “embroidered Mexican tourist jacket” on Etsy yields 41 results. The examples range in price from $30 and $215. Wondering if anyone shared my concern about the imagery, I quickly found out that there are, inevitably, two camps. On the one side are people like Atomic Redhead who, on her fashion blog, admits that she’s attempting to own a Mexican jacket in every color. “[I]t’s kind of hard to have one jacket that goes with every outfit, but since these jackets often have so many colors, it makes it easy to pair it with anything!” She writes. In her view, wearing a Mexican jacket is celebrating Mexican culture. But when it comes to cultural appropriation I wonder where the line is drawn. One perceptive comment, featured on Gertie’s Blog For Better Sewing, mentions our love for French couture. If I love to wear Paul Gautier, does that mean I, who may have never set foot on France, am appropriating French culture? Or better yet, was it insensitive of me to start cooking Mexican food before I had ever been to Mexico? Granted, my husband grew up in Mexico, but he can’t cook and, at the beginning, my food was far from authentic. As always, I think, the devil is in the detail. Personally, I would shy away from wearing a jacket that features a Mexican in a sombrero sleeping under a cactus. This kind of stereotype is a personal insult to my hard-working Mexican husband and my in-laws, not to mention millions of other Mexicans. But is it wrong to find excitement and inspiration in the jackets’ floral patterns and their vibrant depiction of couples dancing among cacti? I don’t think so. In my book, nobody owns a dancing couple, or a cactus for that matter. For now, I have decided on a different kind of embroidery for my poncho. Today the new Boden catalog arrived. It features wool sweaters with the Norwegian designs that are ubiquitous this winter. However, instead of reindeers, my poncho will feature camels that dance around my shoulders. If I’m not too lazy, I might add some “Florentine Embroidery.” Legend has it that the design was introduced by a Hungarian bride who married into the Medici family in Florence in the 15th century. The pattern has been found in Florence in great abundance ever since, making the question of appropriation moot by this point.